Hello, i want to change my 16 Spark Plugs. There are two different spark Plugs. Upper and lower Bank. But what does it mean? lower bank = side under the coil cables ?? And 8 Plugs on the right side exhaust side ?? Although I've had mine replaced, I haven't seen them removed on the Aspen. However, from what I can tell in my service manual pics, the plugs look to be side by side but they are not parallel with each other. One of them is slightly higher (closer to the intake system) and one is slightly lower (closer to the exhaust system). Again, from what I tell in the pictures. This looks to be about 1/4" difference in placement. 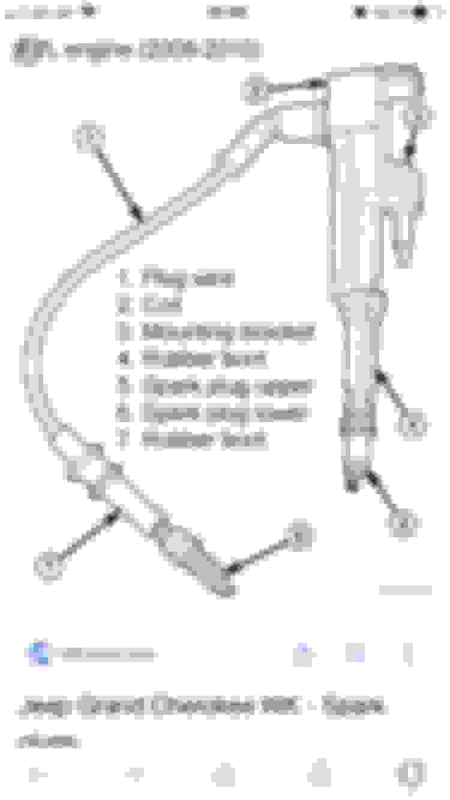 The book even states that the upper is closer to the intake and lower is closer to the exhaust. So I'm guessing this is what they mean. I Order some Spark Plugs on rockauto.com. In the Description They Told exhaust and airintake side??? I found an picture of an Jeep, I think its the same Engine. Is it now right Ehen i install the iridium Plugs on Position number 6 and the yttrium on number 5 ?? On the 4.7L engine...it seems the intake side gap is .039 and exhaust side is .051 gap. Iridium can be used on all of them as the spark plug material. But the gap has to be different depending on position for the different spots in each cylinder. So 8 of the .051 and 8 of the .039. The lower plugs are the 'exhaust plugs' (number 6 in your diagram) Intake is number 5. From the factory they seem to use copper on the intake and iridium on the exhaust. (the reason for this is iridium can withstand the heat from the exhaust better than copper. But there is no reason to not just use iridium all around. .039 gap for the top of each cylinder. .051 for the bottom of each cylinder. Here is a video of a Ram with the same engine. Last edited by themps; 04-14-2019 at 09:03 PM. Wow, didn't realize how much different the spark setup was between the 4.7 and the 5.7. My book doesn't even show the separation between the plugs like this. It only shows the two side by side with one coil pack on top of both (apparently only for the 5.7). Good to know and that video sure helps. 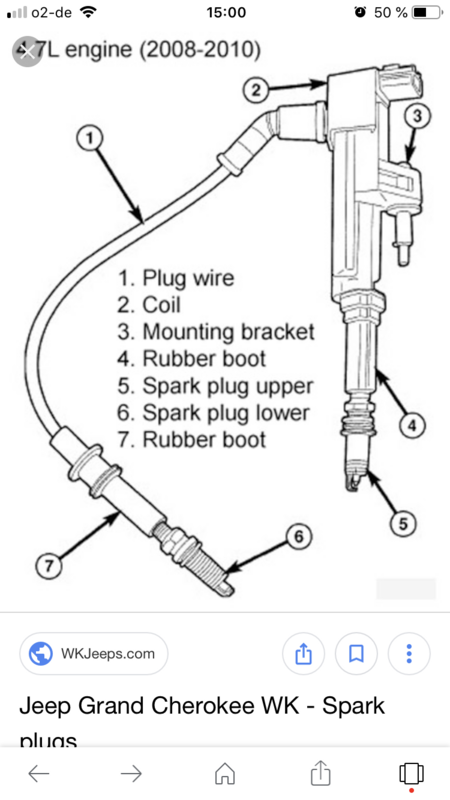 I already knew the video, there was just not shown which spark plug belongs where. But now I know. One question about the engine, only the model from 2008 has the 16 spark plugs. Does that mean the engine is the 2008 revision of the 4.7 HO and got 290- 310 hp? in Germany he was stated with 236 hp. Yeah the Hemi is all the same spark plugs all around as well. It's a little confusing. No problem! Yep so the 4.7 for 2008 got the horsepower up to 303 HP stock. 2008 Was the first year they started using two spark plugs per cylinder and borrowed from the Hemi design to get around 30 or so more HP out of the 4.7. Last edited by themps; 04-15-2019 at 10:10 PM. So are the 5.7 hemi engine spark plugs offset like the 4.7 engine with the gap different also. They have two plugs per cylinder in different spots. But they are all the same plugs / gap etc. What makes a Flex fuel Flex? Anyone using E85 Fuel with their Flex Fuel Aspen?